The most mythologically frightening of the Lost Festivals is now upon us, and I encourage all to be safe as they commemorate the Twelve Days of ancient Earth legend. This article is the first of several installments exploring the origin and meaning of the season's superstitions. The most recognizable symbol of the Twelve Days is, of course, Santa Claus. Contrary to popular belief, the fire demon's name owes nothing to the claw-like hands found in artwork of the mid-28th century. (The name may in fact have inspired the artistic depictions.) Rather, it devolves linguistically from the phrase "The Tock Laws," which laws appear to concern matters of curfew generally, and the midnight curfew of the Twelve Days specifically (see tomorrow's installment: Stockings and Trees). Scholars assert this relates to the distinctive "tocking" noise made by the mechanical clocks of the era. Santa Claus is predictably imagined in red clothing, symbolic of his kinship with flame. He enters a residence by way of the most fire-imbued fixture. In the earliest times this meant a fireplace and chimney, and later a furnace or cookstove. At the birth of the space age, the engine room became Santa's doorway, though modern non-combustion fuel systems have changed this. Now Santa Claus arrives from the hydrogen harvesters or plasma decon tanks, depending upon ship class and local custom. 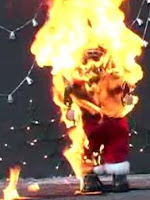 Although he enters homes at sites of potentially lethal conflagration, Santa Claus has always been thought to reside in the coldest of regions. Ancient Earth tradition placed him at the northern pole, an impermanent ice sheet constantly subsumed and regenerated from sub-freezing ocean temperatures. Current myth holds that his home is the inter-wormgate void, where measurable heat is a theoretical impossibility. Presumably, this persistence of a fire demon in the harshest possible conditions is symbolic of evil's persistence and the difficulty humanity will face in triumphing over this dangerous foe. Santa's arrival at midwinter, when nights are coldest, may be related to this symbolism as well, though in my view it is more likely to stem from the fact that this was a time when fire was necessary to light and warm homes, and therefore the danger of fire damage or injury was greatly heightened. Even today, the use of fire in the Twelve Days celebrations is a cause for concern, and all due caution should be exercised.